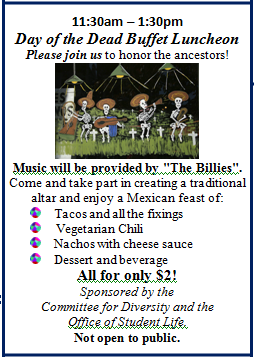 Come to the "Día de los muertos" lunch in the cafeteria on Tuesday, November 1! Have a photo of taken of you and your classmates at the Day of the Dead Buffet Luncheon in the cafeteria. Email your photos to Profe to get bonus points in your Spanish class! Bring an item that reminds you of someone you have loved who has passed away and place it on the Día de los muertos altar that you’ll find in the cafeteria. Come with F R I E N D S ! This entry was posted in BCC Spanish Classes ~ Fall 2011 & Spring 2012, Cool Cultural Information, Language Program Announcements and News, SPA 101 ~ Fall 2011, SPA 131 - Fall 2011, SPA 201 ~Fall 2011 by Lois B. Cooper. Bookmark the permalink.